Bar Professional Training Course (BPTC) students, David Forster and Sara Harrison-Fisher, represented UWE Bristol at the Worshipful Company of Arbitrators Mediation Competition in London on 19-21 January, competing against teams from other Universities, trainee solicitors and pupils. They walked away with prizes for the Best University Team and the Past Master Karl Davies Memorial Award which was awarded to the team with the Most Creative Solution. “David and Sara did extremely well in the face of stiff competition. 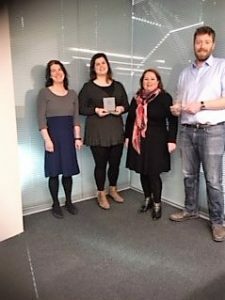 This is the second time in two years that UWE BPTC students have won a prize at this event, which gives them a fantastic opportunity to practice their advocacy and negotiation skills in front of accredited mediators”. 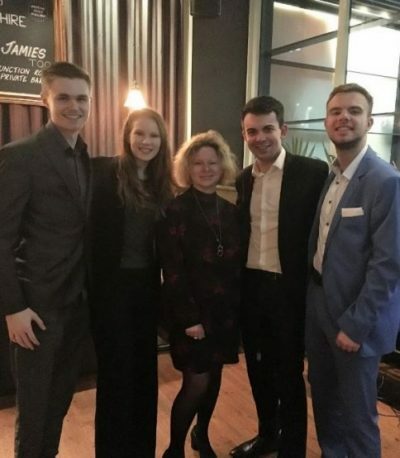 The following weekend saw Law undergraduates, Jade Trill, Callum Tucker, James Hathaway and Jack Kaczanowski, competing in the UK National Student Mediation Competition, held at ULaw in London. The team won the awards for Best Mediation Team, Best Mediator (Jade) and Second Best Mediator (Callum), beating undergraduate and post-graduate teams from 16 universities around the UK. “This is a fantastic achievement for the team, particularly as this is the first time we have entered the National Competition. The students have studied mediation and practised their skills in our internal UWE Mediation Competition. It is wonderful to see their skills being recognised by professional mediators judging them in a national competition”. UWE Bristol now expects to host the UK National Student Mediation Competition in January 2019.